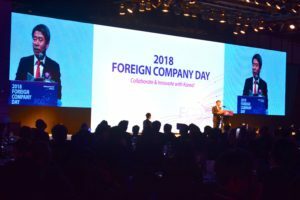 On November 5, the ´2018 Foreign Company Day´ hosted by the Ministry of Trade, Industry and Energy (MOTIE) and organized by Korea Foreign Company Association (FORCA) was held at Grand Intercontinental Seoul Parnas. This event was held to award all of those who have contributed to the development of the country’s economy. To start, the Chairman of FORCA, Mr. Sung-Hyun Lee delivered his opening remarks thanking everyone who have attended. To continue, the awarding ceremony took place. 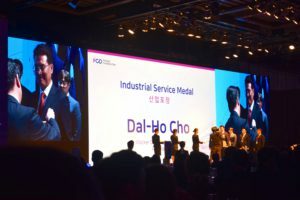 More than 40 people were awarded in these areas: Order of Industrial Merit Tower, Industrial Service Medal, Presidential Commendation(Organization & Individual), Commendation of Prime Minister, and Commendation of MOTIE Minister. To close up part I of the event, the Minister of MOTIE, Mr. Yun-Mo Sung and Chairman & CEO of AMCHAM Korea, Mr. James Kim delivered a welcoming address and congratulatory address respectively. 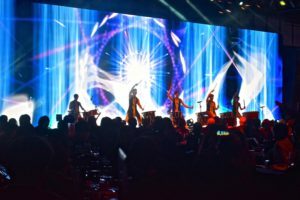 Part II of the event started with a performance of the world percussion group “Gorhy”. After a toast proposal from Mr. Michael Reiterer, Ambassador of the European Union, a course dinner was served to all attendees. At the same time, the Korean musical theatre actress, Mrs. Kim Sohyun, showed a great performance.